The mental image conjured by this term is almost universal. A great westward migration complete with wagon trains and Indians. And then there's the scouts on their trusty steeds protecting the wagon trains; each outfitted with their Colts and Spencer repeating rifles. Every time I hear "Days of Forty Nine" I can almost hear the bullwackers cussing the stubborn oxen, hear the snap of bull whips and taste the choking alkali dust in my throat. Those were the days! 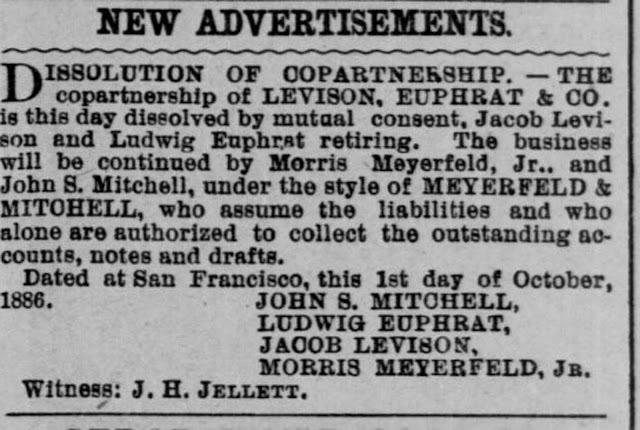 Just before the turn of the century, Meyerfeld Mitchell and Company must have had the same vision. The firm supposedly dates to 1888, and was marginally successful through 1905. The evolution of the firm is as follows; Meyerfield & Mitchell (1888), Meyerfield, Mitchell & Siebenhauer (1889-1893), Meyerfield, Mitchell & Co. (1894-1905). However, I found an article in the Daily Alta California, dated October 6, 1886 stating that the firm had been formed on October 1, 1886 in San Francisco; earlier than first thought. For being in business for so long, not much in the way of advertising exists. Although they marketed a myriad of products including, "Army & Navy Whiskey", "Army and Navy Club", "Barrister Old Tom gin", "Canada Rye", "Canada White Rye", "Cy Hooper Bourbon", "Cy Hooper Rye", "Days of "49"", "Dexter Special", "Dugan's Malt", "Mt. Pleasant Rye", "Old Harvest Home Whiskey", "Pipeline", and "Shasta. ", the only brand that they pushed hard was Days of 49 (well not even hard - more like a whisper). 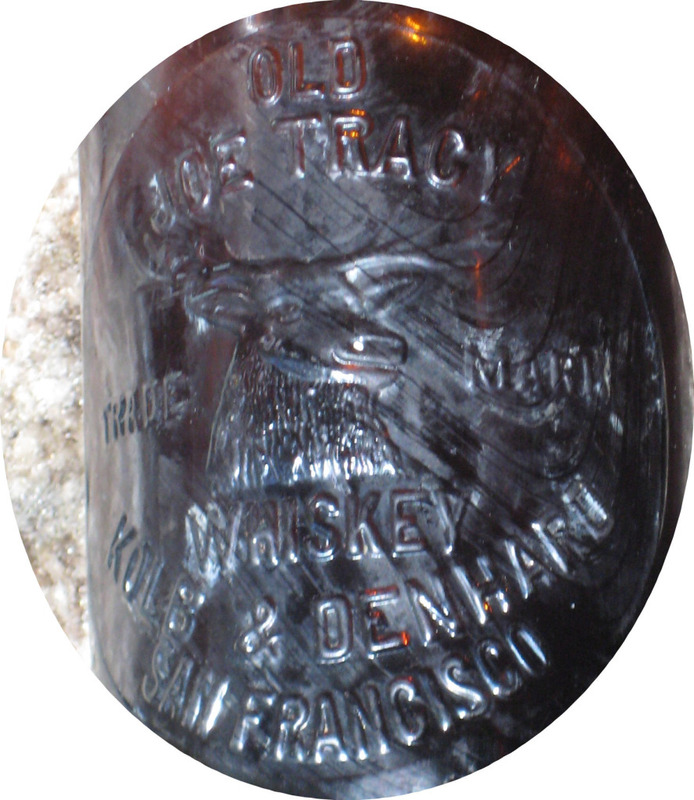 Two tooled bottles exist; a clear fifth cylinder with a ring lip was blown exclusively for the Days of 49 brand, (there's actually a couple of very similar variants of this example). An amber embossed conventional cylinder was also blown. The amber cylinder was a generic bottle that was paper labeled to accomodate whatever need arose. 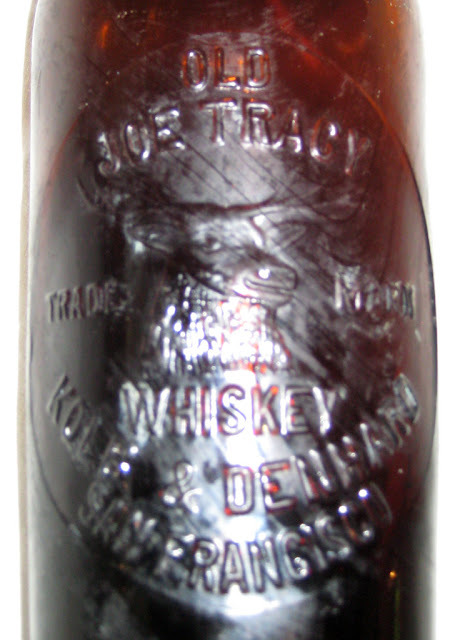 Back to advertising; four different etched glasses were produced. Three were made to advertise Days of 49, one is a generic. 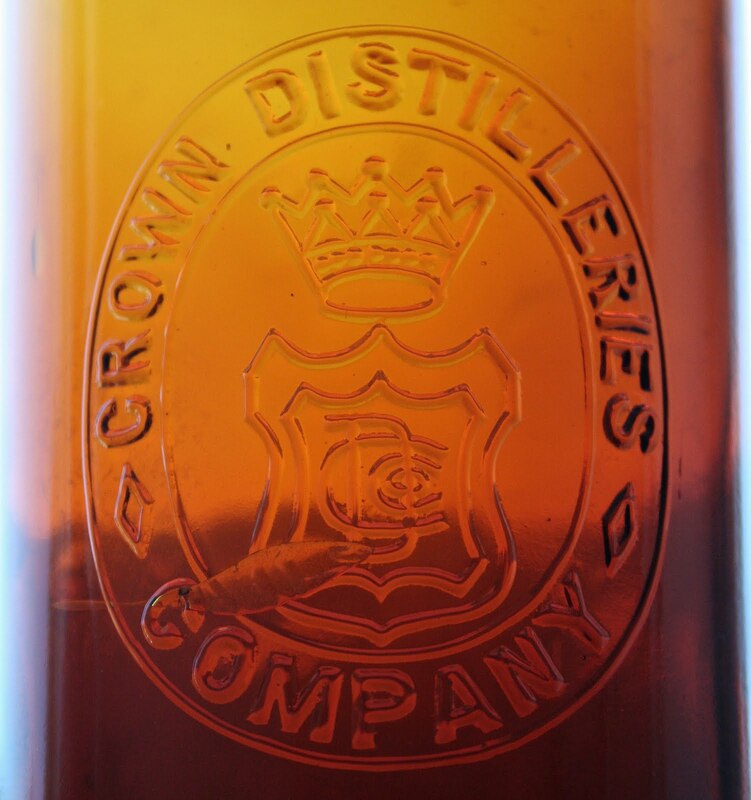 The scarcest one is a logo glass emblazoned with the familiar design that we see on the clear bottle. Less known is the exceptionally rare back bar sign. An exemplary piece of western art, commissioned by M/M & Co. through H.S. Crocker of San Francisco, this one has it all! Let's segway to good ol' J'ville ca. 1895. Located on the corner of Oregon and California Sts. is a quaint brick building that currently houses Scheffels Toys. Back in the day though, it housed the Cronemiller & Love Saloon. 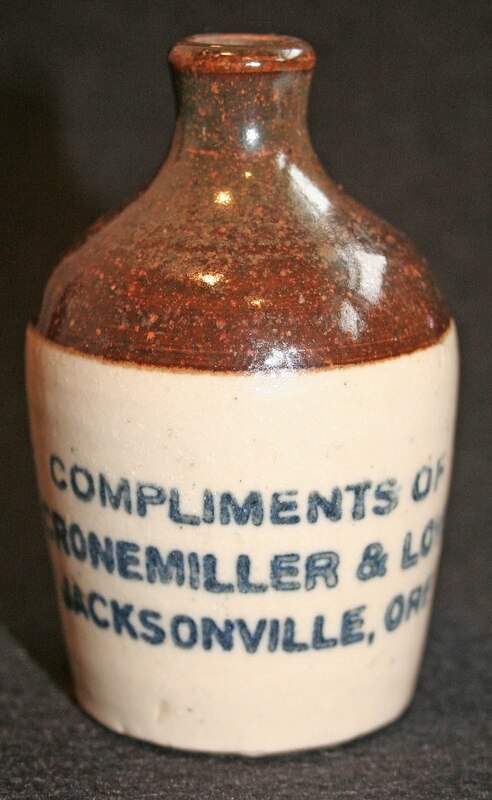 And Cronemiller & Love were purveyors, for a little while, of Days of 49 whiskey. According to the descendent of one of the original owners, his uncle had been a mule skinner in the 1880's, and 90's, hauling freight to the mines out in the Applegate region south of here. Nearly 20 years of being soaked to the bone and freezing cold in the winter, and being choked by thick clouds of dust in near 100* heat in the summer had gotten old. The years and the miles had taken their toll and a more genteel lifestyle was in order. And so Stan's uncle and his new partner plopped their $1500~ in gold down on the back bar and became joint owners of the saloon. Not long after, a whiskey drummer rambled into town. A new brand that he was an agent for was a sure fire thing. "Days of 49 - buy ten cases and I'll give you this handsome back bar sign! You can't miss!" The whiskey arrived on his next trip through town, along with the sign, which was proudly hung on the wall next to the back bar. Apparently the brand wasn't a sure thing after all (since we've never even dug so much as a shard here in town - back when it wasn't illegal to dig...) but the old man loved the sign just the same. He could sit in the comfort of his own saloon, roll his Prince Albert cigarettes, and gaze at the sign while reminiscing about the old days without being punished by the elements. As the song goes, "all things must pass". The writing was on the wall in 1912. Oregon was going dry before the rest of the country and with prohibition looming, the decision was made. The saloon was sold, but with one condition, the sign went with Stan's uncle. 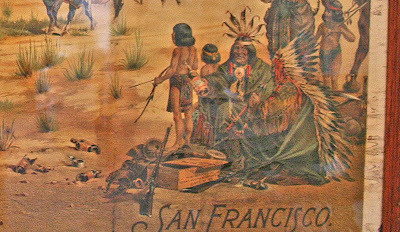 It hung in the blacksmith shop on the ranch out by the Table Rock, quite a ways north of here, from then until around 1960, a reminder of better times. 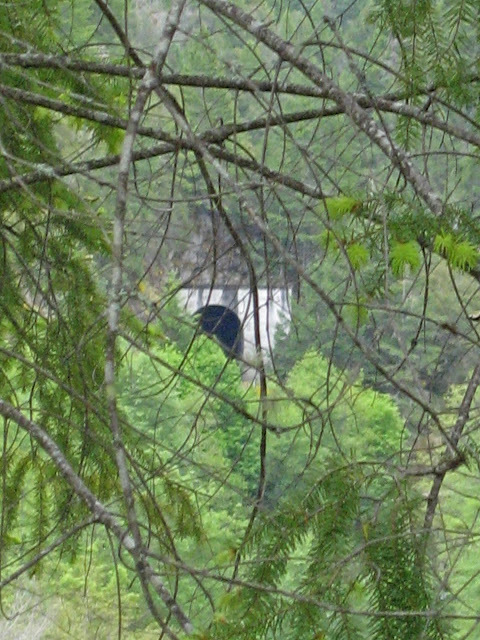 By the time that Stan's uncle died the blacksmith shop was all but falling in. The roof had failed years ago and the walls were skewed at crazy angles. But the sign remained intact; just a little water damage here and there. 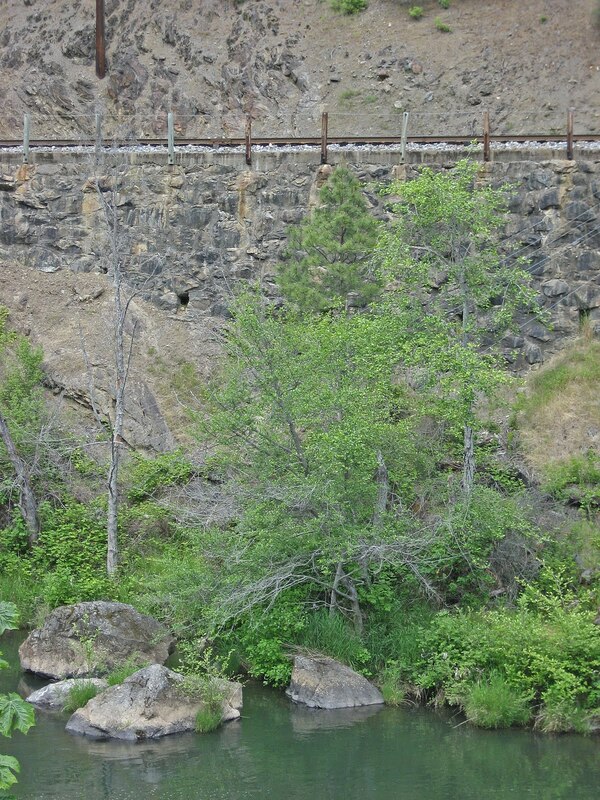 Every relative was allowed to take one item home as a memento of the old man who had been part of the mortar that had cemented Southern Oregon so many years ago. Making his way into the derelict building, the first thing that grabbed Stan's eye was the sign. Away it went to it's new home in northern eastern Oregon. Days of 49, the mental images keep running through my mind like an endless picture loop. Just a quick PS to add today, March 27, 2012. In researching for another article I've determined that the firm of Meyerfeld, Mitchell and Siebenhauer dating has been stated incorrectly in the past. Siebenhauer remained with the company only through 1903. 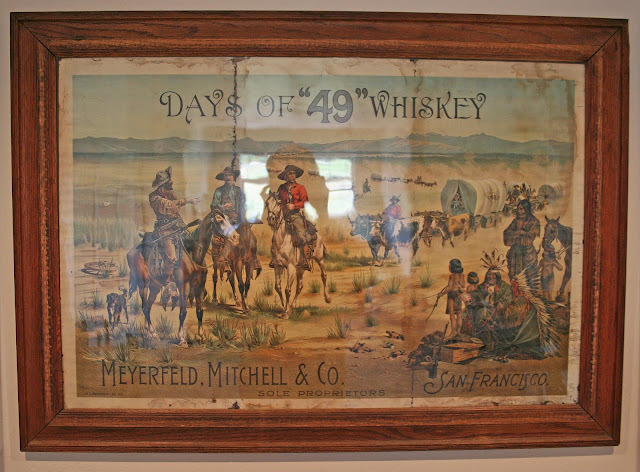 Starting in 1894, the company is listed as Meyerfeld, Mitchell & Co.. Ever try to find the right piece of technology in the "wilds" of Southern Oregon? Don't! After almost a day of chasing around to every place that might, just maybe, have the right part, I tossed in the towel - again. Ears ringing and neck veins pounding, I stopped off to see the guys down at the fire station that I used to work out of. One of them jokingly said that I looked like I was ready to blow a gasket. I was. As a joke, he took my blood pressure. A new personal best; 180 / 138. Today life is slowly returning to normal. I'm now on an exciting diet of fish and chicken, and chicken and fish. And then there's the fish oil horsepills... Ahh, my kingdom for a big juicy steak or maybe a big polish dog, hot off the grill loaded up with all the good stuff! 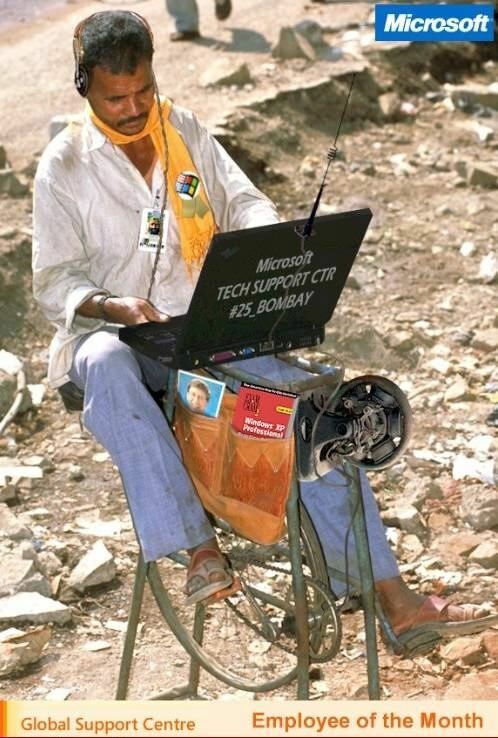 The new modem arrived yesterday afternoon. Guess they had it delivered by pack horse. A couple of hours of fine tuning later and the ol' WWTT Gazette was ready to start churning out articles again. Like I tell my mutt, McKenna; Dig, dig, dig! 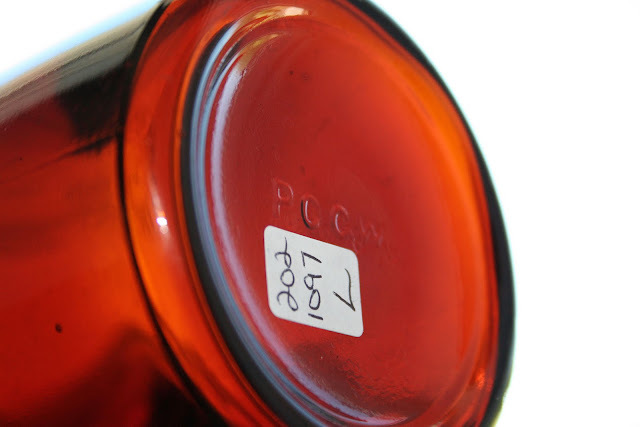 And then there's auction results from American Glass offering number fifty... Talk about a hot topic! Almost without exception, folks are scratching their heads, trying to figure out what makes the auction mentality tick. Although we generally avoid prices like the plague on the Gazette, we'll make an exception and look over a handful of the results that are up the ol' tool top alley. 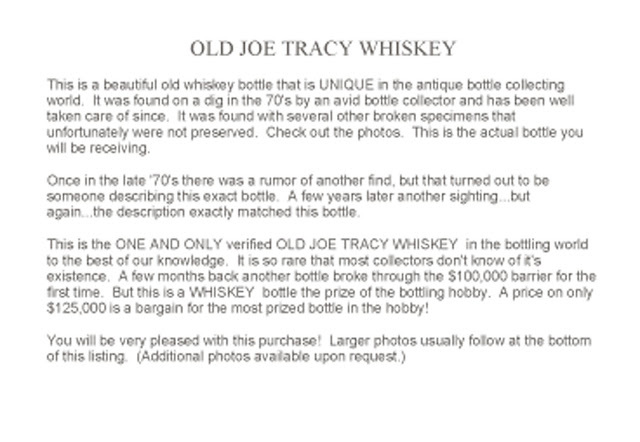 Lot number 271, Big Seven is #47 in Western Whiskey Bottles 4th edition. Graded a 9.6 and called perfect, it darned near brought the big seven, hammering at $672~ including auction fees. Not even I was prepared for that! A scarce bottle yes. But oh my! Lot 272, Remington / 3rd St. is #661 in WWB 4th. The 3rd St. is a little more available than the Washington St. variant. Still, graded at a 9.7 and closing at $179~, I'd call it a good value. Lot 273 was a group of three; a Coblentz & Levy and one each of a Rathjen and Cerruti Mercantile; all in amber. It brought $202~. Again, a good showing but still a fair buy. Lot 275 surprised me. #638 in WWB 4th, Pepper Hand Made, it was rated a 9.5 and closed at $420~. Arguably one of the toughest tool tops around; I'd have thought that it would bring quite a bit more. It was one of the more difficult toolies for me to add to my shelves and I've only seen two others since I landed mine in the eighties. A good solid buy! And then there's lot 276. Good golly Miss Molly! #760 in the book, the St. George Vineyard blew the doors off of everyone's expectations. Described as yellow green and graded 9.7 it brought an astounding $1008~. Not much I can say... A couple of Phoenix Bourbons (a small and large bird) did OK, both bringing over high estimates. A Golden Rule, rated at 9.8, closed at $246~. A good value. Lot #280, a Gold Dust variant #803 in WWB brought a very strong $2688~. That compared to the aqua glop top, lot 292 that closed at $1120~. Proof again that tooled pictures are really coming into their own. I could rattle on forever but think I'll finish this up by saying that as usual, tool top pictures were strong and the rest was a crap shoot. So, you place your bets, take your chances and with any luck, you end up with a winner when the hammer falls. And that's what makes auctions interesting. Just a footnote. Since we made an exception and discussed the almighty dollar; total accrued sales for auction 50 were reported to be $370,000~. That nets $44,400~ in buyers fees at 12% and an additional $64,750~ in sellers fees, assuming an average consignment rate of 17.5%, for a total payday of $108,750~ less overhead. Not a bad paycheck by any stretch of the imagination. Antique bottle collecting is alive and well despite the economy. Congratulations to Jeff and the crew of American Glass Auctions!